Delacorte Books for Young Readers, 9780385739771, 336pp. HOLLY THOMPSON was raised in New England, earned her B.A. in biology from Mount Holyoke College and her M.A. in English from New York University. A long-time resident of Japan, she teaches creative writing at Yokohama City University. "Thompson has crafted an exquisite, thought-provoking story of grief and healing that will resonate with teen readers and give them much to discuss." "This lyrical look at bullying and the afterschocks of suicide may be gut-wrenching, but Orchards is crafted with a sensitive beauty." School bullying seems to be universal. Do you believe a passive bystander can be as guilty as the person who does the over bullying? Who do you think the author, Holly Thompson, chose to write from the point of view of Kana, a girl who contributed to the bullying rather than the girl being bullied? And how is Ruth present as a character throughout the novel? 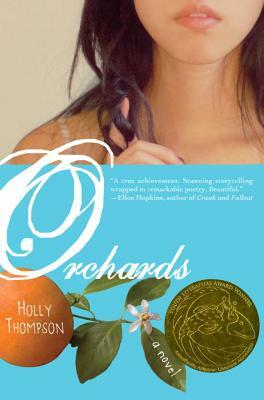 Orchards is a novel in verse. Do you feel it would have the same impact, or be different, if written in prose?